Bundesliga | Vote now for your Bundesliga EURO dream team! 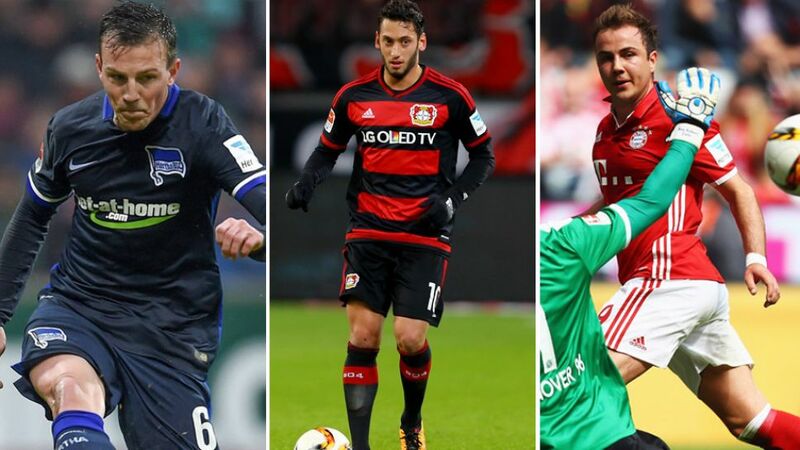 Vote now for your Bundesliga EURO dream team! Courtesy of the Bundesliga's official YouTube channel, every day for the next 11 days you have the chance to choose who will complete the German top flight's European dream team ahead of UEFA EURO 2016 in France this summer. As usual, the Bundesliga is strongly represented at the tournament, but simply watch the video below and vote for who you think should form part of the top flight dream team! Stay tuned for daily updates on who's setting the pace. Who are the candidates and when can you vote? Looking to win your vote in the first of our central midfield votes are three of the Bundesliga's finest ball-playing midfielders. Weigl has commanded a starting spot for Borussia Dortmund in only his first season at the club and could play in his first major international tournament for Germany, while Spain midfielder Thiago will be looking to add the European Championship title to his league and cup double for FC Bayern München in 2015/16. You could also plump for Sahin, a veteran of 200 Bundesliga appearances and a key part of the Turkey squad under coach Fatih Terim. The men that pull the strings just behind your strikers, your attacking midfielder should make and take, and this trio fit the bill. Götze scored the goal that won Germany the FIFA World Cup in 2014, and, after wrestling with injury, helped FC Bayern München secure a record fourth consecutive Bundesliga title; Turkey star Calhanoglu's guile inspired Bayer 04 Leverkusen into the third and final automatic UEFA Champions League place; and Czech Republic orchestrator Darida exceeded expectations following his summer switch from SC Freiburg to Hertha Berlin, helping the capital club into Europe for the first time in seven years. There are goals and assists to come from these three choices for left-midfield. Injury has meant Germany coach Joachim Löw has had to leave Marco Reus at home, but you can still pick the Borussia Dortmand man, who scored 23 goals in all competitions as BVB finished runners-up in both league and cup.Andre Schürrle ended the campaign with nine goals from only 14 games in the Rückrunde; meanwhile, Turkey fans know all about Yunus Malli, who enjoyed his most prolific season to help 1. FSV Mainz 05 qualify directly for the UEFA Europa League group stage. On the wing, will you choose FC Bayern München’s speed demon Coman, who will be hoping to fire France to EURO glory on home soil? Or will you back the pace, dribbling and shooting power of Bayer 04 Leverkusen’s Germany international Bellarabi? Or will it be the industry of Croatia winger Kramaric, who helped TSG 1899 Hoffenheim’s escape relegation after joining from eventual English champions Leicester City FC? Tasked with attacking and defensive duties, these three players are set to stand out for their countries. Hector has made the Germany left-back spot his own after another fine season with 1. FC Köln; FC Bayern München's Alaba is the first name on Austria's teamsheet, for whom he often lines up in midfield; and VfL Wolfsburg's Rodriguez will be hoping Switzerland can parlay their UEFA EURO 2016 qualification form - which saw them concede only eight goals - into the tournament proper. FC Bayern München defender Boateng was voted into the Bundesliga Team of the Season so is the overriding favourite again in this poll, although the competition is fierce once more: Hertha Berlin's no-nonsense stalwart Pekarik would be a valuable addition to any side, while Djourou captained Hamburger SV to safety in 2015/16 with a series of battling displays. Neuer kept 21 clean sheets en route to FC Bayern's fourth successive title triumph, but does he get your vote? Or will it be Borussia Mönchengladbach's Sommer, Switzerland's number one at the EUROs, or will you opt for Ingolstadt's Özcan - vying for the Austria number one jersey - in your European Dream Team?